This is my first experiment with gluten free vegan cookies. They turned out crunchy on the outside, soft on the inside, and really tasty and wholesome. It's nice to have a healthier gluten free snack without the eggs and butter. I enjoyed the wonderful cinnamon aromas that wafted from the oven as they cooked. They are favorites with wheat eaters too, and you don't really notice that they are made without butter. Heat oven to 350F. Beat butter and sugar together until smooth. Beat in the vanilla and egg replacer*. Blend all dry ingredients except for the oats and raisins, and mix into wet ingredients. 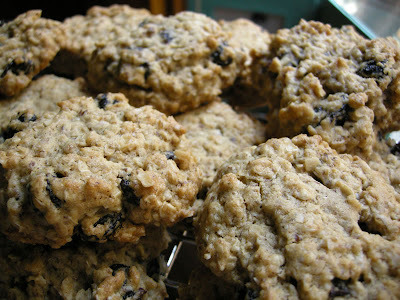 Stir in the oats and raisins. Drop rounded tbsps, an inch apart, onto a lightly greased baking sheet/tray and bake for 10-12 minutes or until they start to go a golden brown. Remove and let cool and firm for 5-10 minutes before transferring them to onto wire rack to cool. *Egg replacer - mix 2 tbsps flax meal with 6 tbsps water and let sit for 5 minutes. They are best eaten freshly baked, and tend to soften when stored but will keep for a few days.